Twitter has a 200 million active monthly user-base; it has great potential for brands to bring promotional activities closer to the customer service experience. Nonetheless, it hasn’t taken off as one might expect, however we do see epic brand fails on Twitter. Only 30% of brands used Twitter for customer service back in 2014. The percentage hasn’t increased much since then. 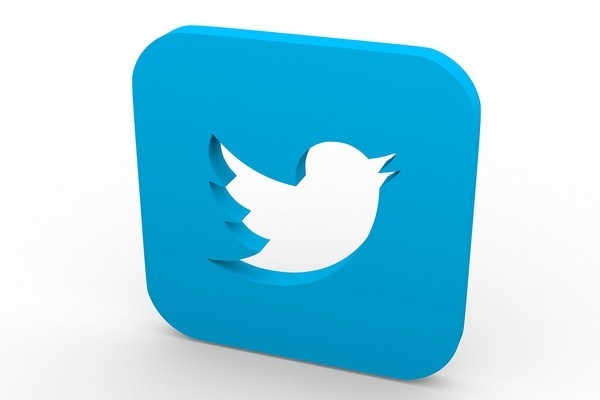 Among the brands that use Twitter, less than 10% address more than 70% of customer queries. Today’s customers, especially those who stay active on social media, are millennials. If they get pissed off, the present and future sales prospect will be hurt. Original Twitter handle is often an engagement doorway. Customers may hesitate to report their complaints there. A dedicated customer service handle can give brands a granular view of customer complaint rate and customer satisfaction rate. Some brands have adopted this approach. Comcast is one of those brands. They have two Twitter handles. One is @comcast, which they use for brand promotion and the other is @comcast cares, used for customer service. When a brand divides its marketing efforts into individual segments, it creates a workforce with varied skill sets. There’s a secondary advantage of having two separate customer handles on Twitter. Since two people handle two different networks, the work gets done in less time, and customers experience a very short turnaround time between their complaints/queries and replies. One way to improve the communication strategy is to minimize miscommunication in the sales cycle. Customers being misinformed or confused when they are purchasing will lead to unsatisfied and disappointed clients. It’s wise to keep reminding customers about the purchasing clauses and the terms and conditions. Brands don’t do that often enough, chiefly because there aren’t many platforms where they can connect to customers and prospects, with the intention of educating them about company guidelines. Twitter is one such platform. A dedicated customer support handle can inform people about policy guidelines. Whenever there’s a change in them, brands can update their handles. This way, they can overhaul existing regulations and streamline relevant information to customers, without having to worry about possible miscommunication. Customers want to connect to brands on many levels, and in different ways. Separate Twitter handles add depth to the interaction and make it more meaningful. If dividing the social media team is not possible due to budgetary restrictions, then companies can at least divide a team member’s time. A healthy interaction has two sides to it - it engages with consumers through comments, tweets and retweets, and it aggressively handles customer’s concerns and queries. When one person or one team handles both, things get jumbled up, resulting in a non user-friendly customer service experience. Recent surveys are pointing out the buyer’s proclivity for personalized interactions. Online retail is as much about product experience as it is about product quality. Customer service reps fail to trigger personalized interaction because they give scripted replies to customers when interacting with them. 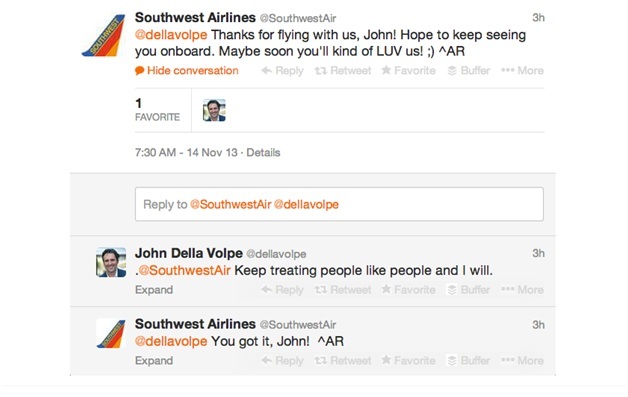 Notice the tone in Southwest Airlines’ tweet. It’s overtly personalized. The prospect customer, John, seemed to appreciate it. 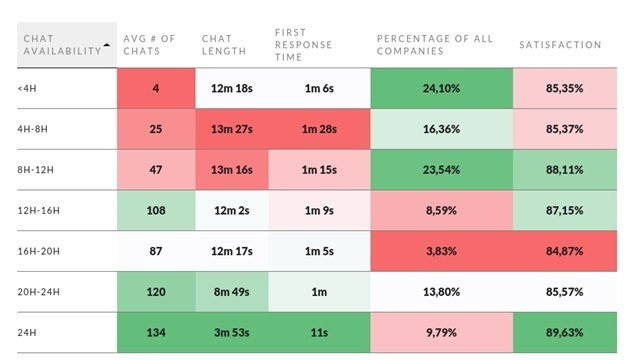 Live chat responses collected from around the world show there’s a correlation between the average chat duration and response time, and customer satisfaction level. Twitter doesn’t allow live chat. But brands and customers/prospect can still connect to each other through a series of tweets. If the responses are personalized, then customers feel taken to the brand. That’d increase the duration of the communication, boost the consumer satisfaction and the increase sales prospect’s viability. 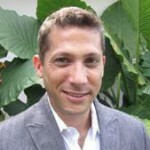 There are several tools to help customer service representatives on Twitter. My favorites are Hootsuite, Tweet reach, Warble, Twitter Counter, etc. The insights retrieved from these tools can be immensely helpful to the customer service teams as they can identify people who are likely to respond positively, anticipate the concerns that customers may come up with and even track the search terms customers are using. Informed replies are better than non-informed replies. The tools mentioned above empower customer service reps by making them more informed about customer behavior and search and feedback pattern. So we can conclude that Twitter is a great platform where brands can run promotions and customer service on parallel planes. They need to give themselves proper time and frame innovative strategies, so that they can harness this unique aspect of Twitter and reap the benefits.